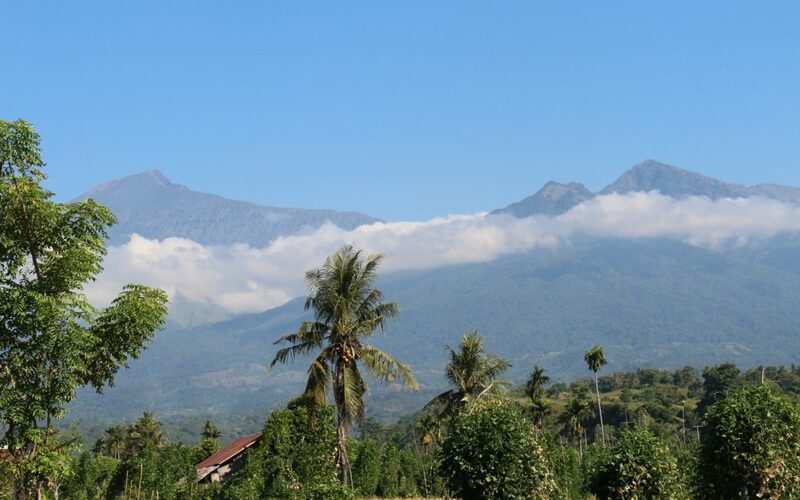 Rising 3,726 metres above sea level, Mount Rinjani is the second tallest mountain in Indonesia and an active volcano with a wide range of landscapes and pockets of incredible natural beauty. The trip up Rinjani is definitely challenging, but you won’t regret it when you are perched on the summit looking out over the edge of Lombok across the ocean and to the volcanic peaks of neighbouring Bali and Sumba rising above the clouds..
As the sun rises early the next morning you will be treated to views out over Lombok’s coastline and beyond to the Gili islands and Mount Agung rising above Bali in the distance. After breakfast it’s onwards to the stunning aquamarine lake in the crater, and then to the hot springs where you can soak your tired muscles in the heated natural spring pools. The third day is probably the most challenging, but also the most rewarding, as you will finally make your way to the summit of the volcano. From the top you can watch the sun rise over the entire island of Lombok lighting up the gorgeous crater lake below, as well as the neighbouring islands scattered along Indonesia’s Ring of Fire. This is definitely a trek and a half, but also an unforgettable experience like no other. Wake up call early in the morning start trail trek to mount Rinjani. Our guide and porters will prepare and serve you meals, drink, along the way. Trek along the national park, see the wild life and feel the nature is completely unforgettable lives experience “that the God’s adventure! !” Arrival at the base camp 2 (two) 1500 m, having the traditional lunch, then continue our trek through the rain forest. And finally we will arrive at the base camp 3(three) 2000m, prepare tents, having night dinner and stay over night. Morning wake up call, having breakfast and enjoy the spectacular view, morning sunrise, lake view and surrounding island. Descent back down to Senaru Village (the finish point of our trek). Arrival at Senaru village, then transportation back to Bali, or boarding mini bus to your next destination in Lombok.